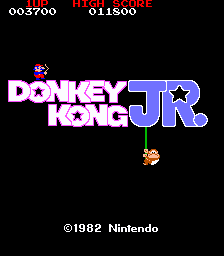 Donkey Kong Jr. is the next exciting chapter in the Donkey Kong saga. Mario has captured Donkey Kong. Free Donkey Kong! Beat Mario! The first Snapjaw will turn orange. The topmost Snapjaw's Y position will go crazy until he eventually lands on the third platform in the water. Blue Snapjaws will start falling through floors. 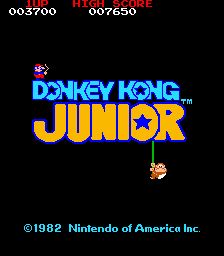 Any time Donkey Kong Jr. jumps, the game acts as if he jumped over an enemy. Most importantly, Jr. won't be able to climb vines, making the game impossible to play. This lightbulb is located with the fruit graphics. It was probably intended to be used in Mario's Hideout, but the standard fruits are used instead. These graphics are leftovers from Donkey Kong, and have no use in this game. These tiles are in the ROM just in case Nintendo wanted to use their full name, Nintendo Co., Ltd. The two "main" versions of the game have different title screens. The earlier version (also the only one released in America) does not abbreviate the title and uses a different title screen palette. 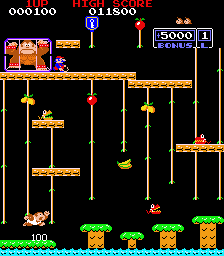 Donkey Kong Jr. expands the number of characters in the high score screen from 3 to 12. The default high scores were increased, as well. 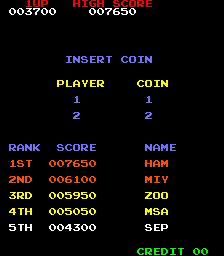 All versions of the game besides the US F-2 set have a consistent stage order: 1-2-3-4, repeating infinitely. 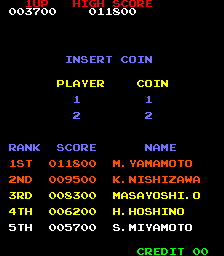 The US F-2 set uses an order similar to (but different from) the US version of Donkey Kong: 1-4, then 1-2-4, then 1-3-4, then finally 1-2-3-4, matching the Japanese version. This last order repeats until the end of the game. This page was last modified on 9 April 2019, at 18:55.